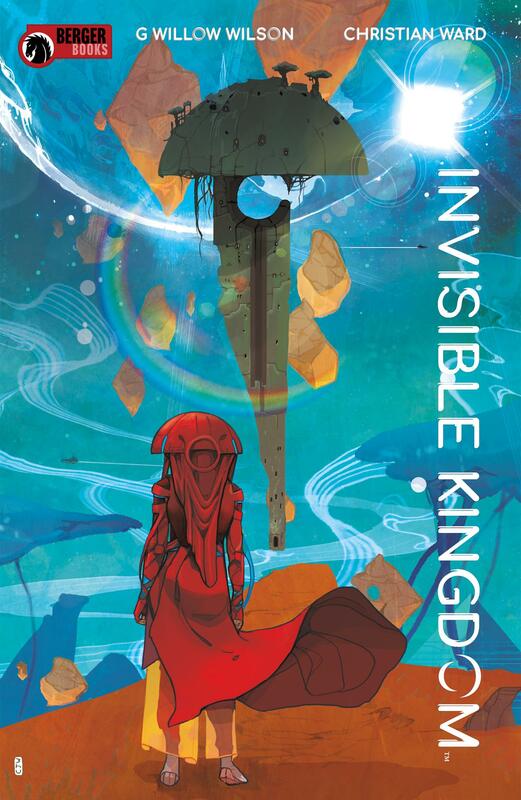 Dark Horse announces G. Willow Wilson's 'Invisible Kingdom', coming March 2019 – AiPT! The book will be a part of Dark Horse’s new Berger Books imprint. G. Willow Wilson’s a busy person these days — she’s still writing the critically acclaimed Ms. Marvel series for Marvel, and it was recently announced that she’ll be taking the reins on Wonder Woman along with Cary Nord come November. That’s not all though, as today Dark Horse Comics announced the upcoming Invisible Kingdom, written by Wilson with artwork by Christian Ward, to be published under their new Berger Books imprint in March. Set in a small solar system in a far-flung galaxy, Invisible Kingdom tells the tale of two women–one a young religious acolyte, and the other, a hard-bitten freighter pilot, who separately uncover an unholy conspiracy between the leader of the Renunciation, the system’s dominant religion, and Lux, the all-consuming mega-corporation that controls society. On the run from dangerous reprisals on both sides, this unlikely pair of rebels risks plunging the world into total anarchy if they reveal the truth. But when your beliefs betray you, what choice is left?